If you don't mind, I would like to go back in time for a second. Back to that day I talked about pushups and how to perform them. Yes, I realize this was but a few days ago, but I'd like to expand on something directly related to what I talked about. Directly related to your wrists, actually. Because as I said before, weak wrists wreak havoc on your pushup game. And while pushups can strengthen your chest muscles (and more), they don't do much for the muscles nearest and dearest to the eight bones in your wrist. The eight carpal bones, to be specific. Little tiny balls held together by tendons and muscles, supported further by all the muscles in your forearm. The above will give you a general sense of what I am talking about. (I'll spare you the scientific mumbo-jumbo for now.) Take note of the brachioradialis. While it gets some action whenever you perform a hammer curl, it's the extensor muscles that get forgotten most frequently. 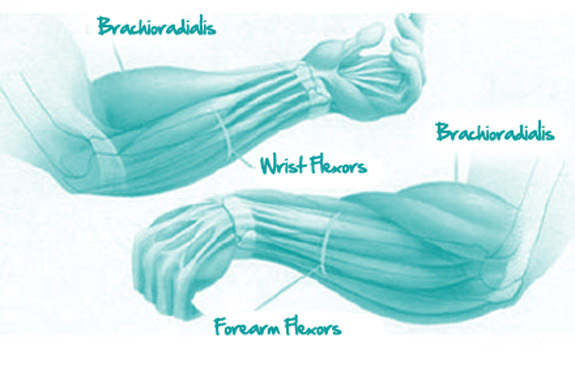 And it's these muscles, along with the brachioradialis, that truly support your carpal bones. So let's talk about how to strengthen them, because really---when was the last time you thought to strength train your forearms directly? 1) WRIST CURLS: With a weight in each hand, rest your forearms on top of an exercise ball, bench or table. Let your hands hang off the edge, palms facing toward the ceiling. Just like a bicep curl, raise and lower the weight, moving only from the wrist down. Repeat desired repetitions, then flip your wrists so that your palms face the floor. Do another set of repetitions here, same motion. Note that these exercises can also be done standing, using an exercise band with handles. Quite possibly even a bodybar if you've got access. 2) ROPE ROLLS: You'll need some equipment for this one. Gather a rope, weight plate or dumbbell and a bar of sorts. Something light, like a broomstick. Tie the rope to the weight, and tie the other end of the rope to the bar. You'll want it tight enough...to the point where the bar won't rotate inside the knot. Grab the bar with both hands, palms facing the ground. Standing tall, proceed to roll the bar in an effort to raise the weight off the ground, consequently rolling the rope up and around the bar. Release the weight and repeat to complete your second set. 3) HAND WIPES: Hold a very light weight in each hand. Bend your arms to 90 degrees, tuck your elbows into your sides and face your palms toward the floor. Move your hands back and forth, as if you were wiping something off the floor. Back and forth, back and forth. 4) ISOMETRIC CONTRACTIONS: Clasp your hands together in front of you, fingers interlocked. Press your hands together hard and hold for 15 seconds. Relax and repeat, working your way up to a total of 30 seconds. Remember that any sharp pain is a direct attempt by your body to make you stop doing whatever it is that's causing the pain in the first place. If you have weak wrists, it is absolutely essential that you keep this in mind as you proceed. And please, do proceed! We tend to focus on our main muscle groups, forgetting the smaller (and equally important) muscle groups. You can't pick and choose the muscles you want to train--you should be training them all quite regularly. Luckily, there are a wide variety of compound exercises out there that help us get all that training done. What's a compound exercise? An exercise that uses more than one muscle group. But let's talk about that another day. It is, after all, Friday. And although it's not looking too good, I do hope to get out and go for another walk. Yesterday turned out to be less than desirable. (I told you spring in Michigan is silly.) Pockets of sunshine, sure. But generally quite overcast. And I hear there's more of it in my future. Can someone please send me some sunshine and summertime? On a brighter note, I think I decided on a heart rate monitor. Let's hope Best Buy has it in stock. I'm not one for patience when it comes to buying new toys! Question: What muscle group do you repeatedly forget to train?